Show Date: Saturday, February 4, 2017. 9870 Broadmoor Dr, San Ramon, CA 94583. Bret Cappelluti, Effect-Music. Madera, California. Keith Dunton, Effect-Visual. Pasadena, California. Dan Bryan, Music Analysis. Modesto, California. Bret Mascaro, Visual Analysis. Collegeville, Pennsylvania. 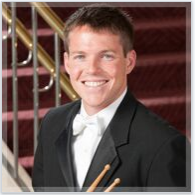 Jacob Nissly will be joining us to provide a marimba performance clinic. He will also discuss practice and dedication. Jacob was appointed Principal Percussionist of the San Francisco Symphony in 2013. Previously, he served as Principal Percussionist of the Cleveland Orchestra and the Detroit Symphony. He was also a member of the New World Symphony. Jacob is an adjunct Professor of Percussion at the Eastman School of Music. Mr. Nissly holds degrees from Northwestern University and the Juilliard School. He began his percussion studies with Woody Smith in Iowa.